Siberian ginseng is rich in “eleutheroside” and “isofraxidine”, which support health cycle. 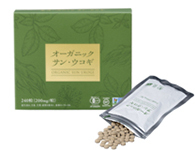 It also contains a type of polyphenol, “chlorogenic acid”, which helps to keep youthfulness. Siberian ginseng supports your healthy and vigorous life. All of carefully selected ingredients are organic JAS certified ones and no additives or preservatives are used. Organic Sun Eleuthero is suitable for those who like to stick to organic product.